The Zimmer MedizinSystems Cryo is award winning technology, having been declared the Best Stand Alone Epidermal Cooling Device which is an Editor’s Choice Award for Aesthetic Trends and Technologies. This critical acclaim undoubtedly comes due to the device’s plethora of exceptional qualities and impressive features. The Cryo 6 maximizes comfort and minimizes side effects for the patient all due to its unmatched cooling methods. Apart from this, further characteristics of this state of the art technology which deservedly received acclaim from the entire aesthetic industry are its easy maintenance and service, along with its excelling filter cleaning, and unique container which provides condensed water. The device also includes indicators for defrost-cycle, and the fact that it has no consumables is well worth the highlight on its own. As compared to other methods of cooling, including ice packs, cryogen spray, or contact cooling, the Zimmer Cryo 6 excels. This is because the device is well capable of cooling the epidermis whenever required. This means it can cool before, and during, as well as after all IPL or non-invasive laser procedures. The operator has the option to choose from 9 varying air flows. This is a highly effective feature as it enables you to customize the system’s intensity of skin cooling as per your own requirements. The Zimmer MedizinSystems Cryo 6 offers customizable features which provide both practitioners and patients an extensive grip over every aspect of cooling. The highly advanced and easily operable system initiates at the push of a button. All you need to do from then on is select your desired program and hit start. The Zimmer Cryo 6 features customizable settings to give both patients and practitioners complete control over the level of cooling. The machine is easy to use and starts at the push of a button. Apart from that it facilitates the users with easy and clear operational instructions as offered by the touch screen keyboard. The integrated platform made of flat glass delivers a spacious area which can be utilized for IPL, laser, or accessories. Hands free operations are also facilitated by the articulating arm (which is an optional feature). The system has no consumables, which proves that it is reliable and powerful enough to remain efficient throughout heavy duty operations. The device is well capable of providing all day cooling due to its lightweight hose which gives filtered chilled air at -30C. Treatment areas which are difficult to reach can be covered with this hose. 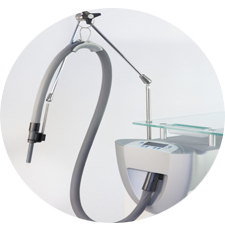 The system is widely used throughout the aesthetic marketplace by all kinds of practitioners. This is essentially due to the fact that the Zimmer Cryo 6 provides highly comfortable numbing to the patients’ skin that is necessary in several skin treatments as without sufficient relief from pain, the procedures are much likely impossible to carry out. The Cryo 6’s epidermal skin numbing technology reduces pain and chances of thermal injuries, ensuring the highest level of satisfaction for patients. Zimmer Medizin Cryo 6 Is the Best Choice! 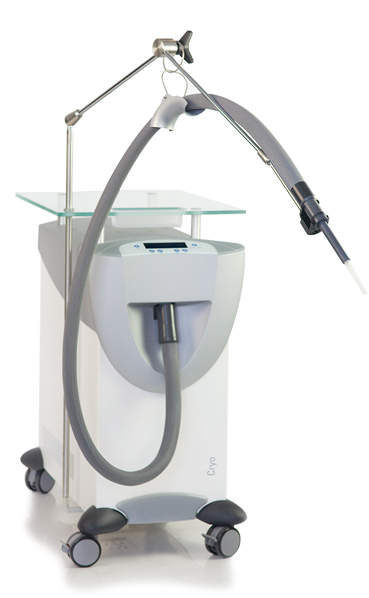 Professionals throughout the aesthetic industry extensively use the Cryo 6 for many different cosmetic and dermatological laser treatments. . 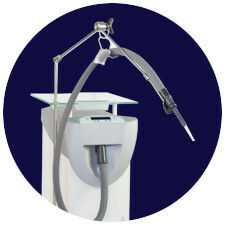 The system ensures optimum patient comfort and streamlines the entire procedure, minimizing the risks of any injuries. For all kinds of aesthetic laser practitioners, it is a fantastic addition to their operation theatre as it facilitates aesthetic procedures with rapid and effective numbing for patients. It goes without saying that the Zimmer Cryo 6 technology is the best choice for all sorts of aesthetic treatments. 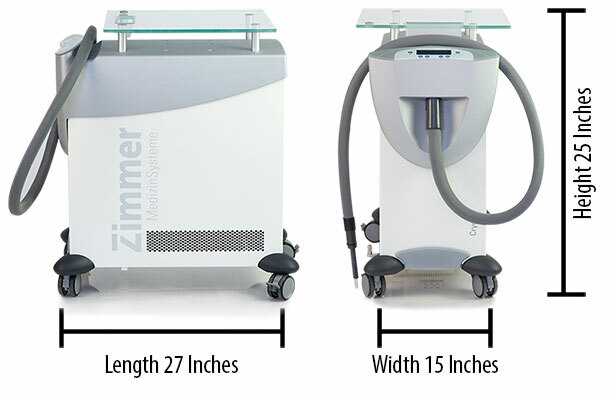 The Zimmer MedizinSystems Cryo units have a loyalty unmatched by any other cosmetic laser cooler in the industry. And the legacy continues with the Cryo 6, the exhilarating apex in Zimmer Medizin Chillers. Offering bold styling, space saving glass top, hands-free operation, 9 fan speeds, ergonomically designed touch keypad, lightweight treatment hose, and easy maintenance. 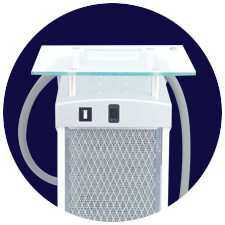 The Cryo Six offers a flat, glass platform that can be used to accommodate a laser, IPL, smoke evacuator, or other accessories. The glass platform can accommodate a maximum weight of 75lbs. An optional articulating arm provides the operator hands-free use. 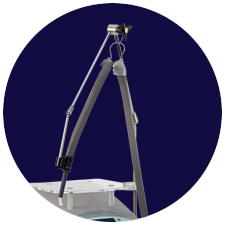 The operator attaches the Cryo 6 Hose to the articulating arm, and then positions the articulating arm over the treatment area. Adjusting the treatment time and therapy fan can easily be changed by a single touch of a button. The operator just needs to touch either the down or up arrow key to adjust both settings. The Zimmer Cryo 6 control panel is sophisticated, easy to use, and beautifully designed. When you turn on this laser cooler, the unit performs an automatic self-test to check the operation of its various components. This Zimmer Cryo 6 features an air filter that should be vacuumed weekly (Don’t Remove), and a condensation collector that should be emptied weekly. The Zimmer Cryo 6 Hose allows the refrigerated air from the Cryo 6 unit to be delivered to the treatment site. A focusing tip can be connected to the end of the hose to provide a more controlled spot cooling experience. The Zimmer Cryo 6 was an easy decision for us after our patients were complaining of the pain from the laser treatments. 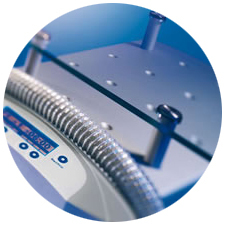 This Cryo unit delivers -30c air and has 9 adjustable fan speeds, allowing us to accommodate almost all patient types. Press start. That’s it. With its innovative approach to design, utility, and performance the Zimmer Cryo 6 translated the needs of discerning medical professionals into a new expression of luxury. 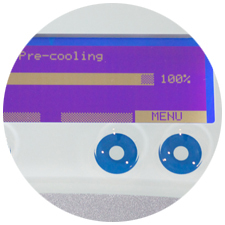 This user friendly cooler offers a sleek touch screen that is clear and easy to use. Select the desired fan speed, adjust the time, and press start, that’s it. The perfect Zimmer cooling experience is only a push of the button away. The practice decided to purchase a New Cryo 6 unit for our tattoo removal laser after hearing from the patients the laser treatment was very painful. This Zimmer Chiller was the best investment for our new laser spa, without it we would have lost many patients.